Condo Living: Too Many Amenities? 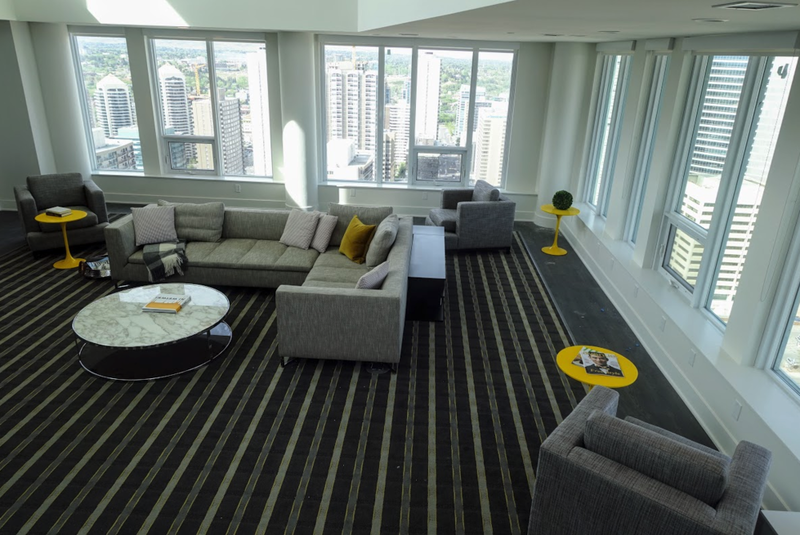 There seems to be a bit of “one-upmanship” happening, these days in Calgary when it comes to condo amenities. Bruce McKenzie, Vice President, Business Development, NORR Architects Engineers Planners tells me they are working on a project that will have luxury guest suites in a prime location looking out onto the Elbow River, a jogging/walking track, a large garden also overlooking the Elbow River and a solar cell phone charging area. It will even have its own dog park. Imagine this is your communal living room! If I lived at Qualex Landmark's Mark on 10th condo, I don't think I would ever leave the building. 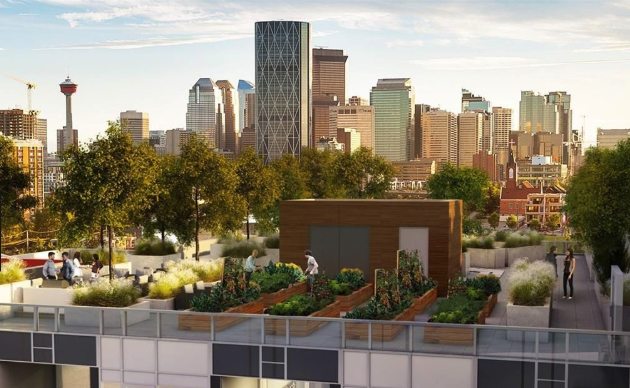 Bucci's Radius condo in Bridgeland will have a community garden on its rooftop. What a great way to meet your neighbours without leaving the building. This may well have started in about 2014 when Concord condo was announced with its all-season garden (i.e. garden in the summer; private skating rink in the winter), two story garages so you can store all of your four and two-wheel toys and even have your own work bench. There is also a golf simulator, luxury pool area with its own resort-like lounge, as well as an upscale workout/yoga studio. This could be all yours if you lived at the Concord....why would you want to leave? 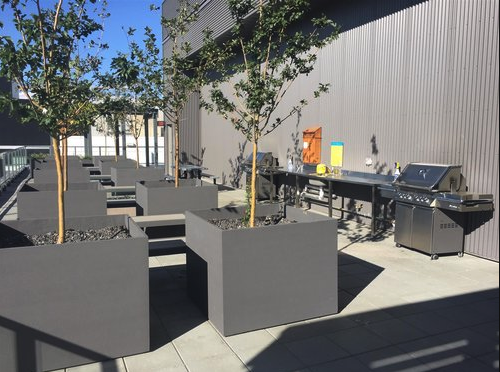 Not to be outdone Qualex/Landmark did away with the penthouse suites in their Mark on 10th project, replacing them with amazing rooftop amenities for all residents. This includes an outdoor BBQ area with a large hot tub with spectacular mountain views and a huge lounge area with kitchen floor to ceiling window overlooking downtown. Who needs to go to the spa when this is your hot tub at Mark on 10th? N3 condo's roof top offers amazing views of the downtown and sunsets while you cook up dinner on the BBQ. Even the “no parking” N3 condo project in East Village, has a spectacular outdoor roof-top amenity with great views of new Central Library, the National Music Centre, Stampede Park, downtown, Bow and Elbow Rivers and the Rockies. It also has an attractive indoor roof-top exercise room and the BBQ area has become the communal living room for residents. Right outside their front door is the funky Brewer’s Apprentice offering 48 beers on tap that you can take home and just around the corner is Tim Hortons. No need to venture very far. Parham Mahboubi, Vice President, Planning & Marketing, Qualex Landmark tells me “When we design building common areas and amenities, we are thoughtful of how these spaces contribute to bringing neighbours together. 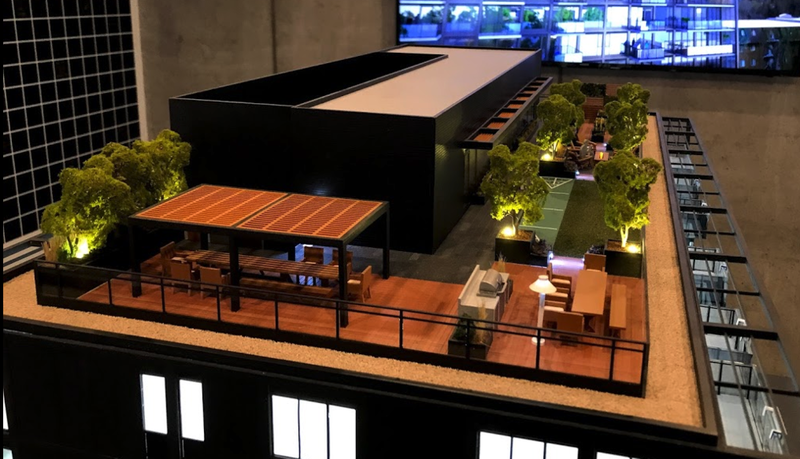 For example, in Park Point, about 9,000 square feet of amenity areas offer homeowners a place to converge, whether it is the outdoor Zen Terrace, the infrared sauna, gym, yoga/pilates spaces or the outdoor lounge and BBQ area." As I was writing this piece for Condo Living Magazine, I happened upon Minto Communities’ Annex project in Kensington designed by Calgary's Nyhoff Architecture. I learned they will have a multi-use roof-top that will include dog run, a fire pit area, BBQs and what looks like a shuffleboard area. Minto Communities' Annex condo rooftop in Kensington will offer spectacular views of downtown, as well as a private urban playground. Who needs noisy street patios? The trend to building in-house amenities in new condos may well be counter-productive, as the whole idea of increasing the number of people living in the City Center was to create more street life. In theory the new urbanites would live in their condos but leave them to mix and mingle in their neighbourhood cafes, lounges, bistros, yoga/fitness studios, parks and pathways - be that Beltline, East Village, Eau Clare, Downtown or Mission. Who is going to do that when you have your own lounges, fitness areas, pools, hot tubs and park-like spaces in your own building. I wonder what is next!